The client needed some extra space in the house for a growing family and somewhere to entertain guests. We were asked to design and build a garden annex that could be used all year round, compete with electrics, internet and eventually a wood burning stove. We began by producing a number of proposals for the client, one including an oak frame canopy and the other with stunning black and cedar cladding imported from Canada. Once these were complete we developed the drawings into full plans and submitted them to the local council for a lawful development certificate (LDC). This is a certificate from local authority confirming that the plans do not need planning permission, something that may be queried if it ever came to selling the property. Although the project is large, we were still able to get it successfully within the permitted development laws, so now planning was required. For the construction we used a prefabricated structural wall panel called a SIPs panel, this comes ready insulated allowing us to have to have the walls up and roof on within a week. In total there were nine layers in the wall construction, making it a very well insulated and weather resistant structure. We finished the build with black cape cod cladding, with western red cedar highlights. Aluminium windows and bifold doors were used to give a nice contemporary high quality finish. Internally the annex is plastered with a full electric fit-out. Oak laminate floors was used on the floors and traditional slate completes the roof. We recently built this 3m x 2.5m garden office in the centre of Tansley, a small village just outside of Matlock, Derbyshire. The client operates a business from home and had previously been working in a spare room in the house. We were asked to design and build a garden office that could be used all year round, compete with electrics and internet. As with all of our projects we began by completing a proposal and full quotation for the client, we worked through the designs with them and finalised the designs. The result is a stunning addition to the house, that creates some seperation in the house from work whilst also adding value to the house with minimum disruption. We were asked to take a look at designing a garden office to fit into a tight garden in the beautiful Richmond in London. The client works from home as a software engineer and after working on the dining room table for a number of months needed some dedicated space. The project also included a secure shed compete with inbuilt bike locks and cedar cladding to conceal the door. As with all of our projects we began by completing a proposal and full quotation for the client, we worked through the designs together and came to a proposal that suited both their needs and budget. Once these were complete we developed the drawings into full plans and submitted them to the local council for a lawful development certificate (LDC). It turned out that the housing development had been built on the site of an old aircraft factory which amongst others built the Sopwith camel bi plane. Which whilst is an interesting fact it did mean that our usual ground auger was useless and we had the pleasure of digging through a large portion of concrete as we dug the foundations. We prefabricated much of the garden office in the workshop and delivered it to site on a lorry. After installing the structure we liaised and managed local trades to complete the plastering and electrical jobs. The finished project is a stunning garden office, which has added some valuable space in an area where space is at a premium, which has been reflected in the increased value of the house. One of our earliest projects, what began life as a fairly simple design eventually developed through the design stages to a 8m x 4m studio, shaped to fit into the corner of a garden. Complete with electrics and plumbing it creates a huge amount of functional space, for the client who runs a sculpture business. With many of our projects, we were asked to develop some dedicated space to give some all importance work/ life separation. The project includes feature green oak posts and cedar cladding to the external walls. Internally the walls were plastered and oak laminate floor and insulated underlay laid on the the structural timber floor. Due to the nature of its use we added extraction fans and air vents to ensure the air circulated creating a comfortable and airy space. 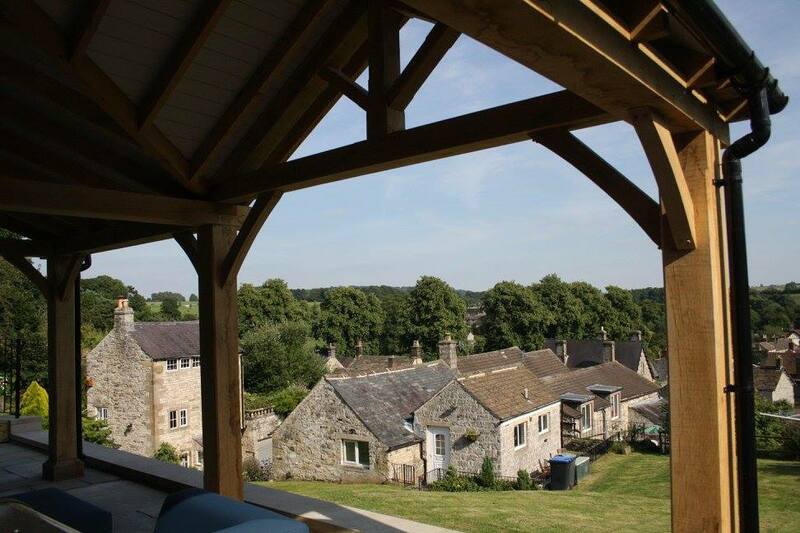 We designed and built this beautiful oak framed canopy in the heart if the peak district. Set in a central village location in a particularly historic and beautiful part of the peak district it was important that a quality and considered approach was taken. Locally sourced green oak was used in the frame, the oak will weather, twist and age naturally. Set on dressed stone plinths from a local quarry to match the existing raised patio. Using traditional oak framing techniques which have been used for hundreds of years. Mortice and tenon joints were used and fixed using hand cleft draw dowels.